For the last few years I have thought of undertaking a long bicycle tour to support the building and rebuilding efforts of Habitat For Humanity especially those in the wake of natural disasters. My plan is to circumnavigate the perimeter of the country. A focus of my ride will be to raise awareness of Habitat's building programs at home and abroad and their mission to provide basic, decent housing to those in need of a home. I hope to encourage those I encounter along the way to make a donation in support of Habitat For Humanity. Additionally, as I travel I intend to visit local HFH affiliate chapter and spend a day volunteering on one of their current projects. To find out more about this journey please visit my website at http://usperimeterride.org which is linked to this HFH fundraising page. Bicycle touring has been a large part of my life for the last 35 years. I have bicycled on 5 of the 7 continents and have traveled solo and with groups. I have always considered bicycle travel a wonderful way to encounter the world and its inhabitants, allowing you to experience the land with all five senses . . . and a fair amount of sweat. In 1985 I took a year's sabbatical from teaching world history in Sylvania, Ohio, to travel around the world with my bicycle, peddling close to 10,000 miles. It was the time of the Ethiopian famine and I attempted to raise awareness of Red Cross efforts to alleviate hunger in East Africa. I detailed that year of adventure in my book, "One Time Around A Solo World Bicycle Adventure." 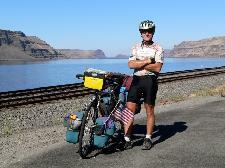 Twenty years later in the summer of 2005, having retired from teaching the year before, I bicycled 4000 miles along the Lewis and Clark Trail from St. Louis, Missouri, to Astoria, Oregon. This modern "Lewis and Clark Expedition" served as background research for a Lewis and Clark re-enacting program in which I take part, but I also had sponsors who made pledges in support of my ride and three worthwhile charities: the Susan Komen Breast Cancer Foundation, the American Cancer Society, and the Alzheimer's Association. 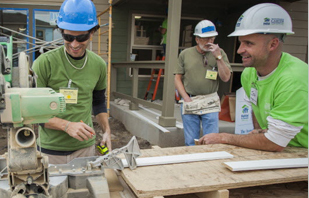 The mission of Habitat For Humanity appeals to one of the basic necessities of life - to provide basic and decent housing for those in need here in the U.S. and around the world. Please consider making a donation in support of Habitat For Humanity. Habitat for Humanity International's vision is a world where everyone has a decent place to live. Anchored by the conviction that safe and affordable housing provides a critical foundation for breaking the cycle of poverty, Habitat has helped more than 3 million people construct, rehabilitate or preserve homes since 1976. Habitat also advocates for fair and just housing policies and provides training and access to resources to help more families improve their shelter conditions. As a nonprofit Christian housing organization, Habitat works in more than 70 countries and welcomes people of all races, religions and nationalities to partner in its mission. To get more information, to donate or to volunteer, please visit habitat.org.